Footballer Emiliano Sala’s family grieved yesterday after British authorities formally identified his body as the one recovered from the submerged wreckage of a plane that went down in the Channel more than two weeks ago. “We can now begin to mourn our son and our brother,” the Argentine Cardiff City striker’s family said in a statement. “We would like to thank you for all of your signs of affection and support in the most painful time of our life. “To see everyone doing everything possible to join us in the search has been a precious help to us,” the family said. Argentine footballing idols Diego Maradona and Gabriel Batistuta also paid tribute to Sala, 28. 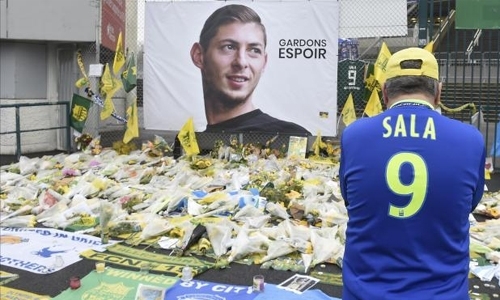 The Premier League player’s former French club, Nantes, said it was withdrawing the jersey with Sala’s number 9 on it and all Ligue 1 and 2 matches in France this weekend will be preceded by a minute of applause for him. The light aircraft was carrying Sala from Nantes to his new team when it disappeared near the British island of Guernsey, along with 59-year-old pilot David Ibbotson, who has not been found. The player’s body was first spotted by British rescuers using a remotely operated underwater vehicle on Sunday close to where the plane vanished from radar on January 21. Investigators recovered the body on Wednesday and transported it to the Isle of Portland in southern England. From there it was taken to Bournemouth where it was formally identified later. Investigators said they were abandoning plans also to lift the plane wreckage out of the water because of bad weather. Sala’s disappearance sparked an outpouring of grief and a flood of cash to support a private hunt for the plane when the official search was initially called off. “I am very sorry about this sad news. Many of us kept a glimmer of hope for you, Emiliano,” footballing superstar Maradona said on Instagram, after the identification of the body. “What sadness, this is the worst news. Rest in peace warrior,” tweeted retired Argentine football star Batistuta. The country’s President Mauricio Macri also offered his condolences to Sala’s family following the “painful news”. “We are with you,” he added. The small Argentine town of Progreso, where the footballer lived for most of his childhood, was also in mourning. “Since we found out, it’s all anyone can talk about,” said local restaurant owner Oscar Heymo, a friend of Sala’s father Horacio. “He was very much loved and admired by all.” Cardiff City on Twitter expressed their “heartfelt sympathies and condolences to the family of Emiliano”. “He and David will forever remain in our thoughts,” they said. The plane, a Piper PA-46 Malibu, vanished from radar around 20 kilometres (12 miles) north of Guernsey. The discovery of two seat cushions on the French coast last week revealed that the plane had broken apart. Initial search operations were suspended in the days after it went missing but a crowdfunding effort supported by thousands of donations, including from football stars such as Argentine superstar Lionel Messi, helped launch a private search. Without the fundraising effort “I don’t think anybody would have searched for the plane,” shipwreck hunter David Mearns, who was hired by the family, told AFP. The plane wreckage was spotted by a ship hired by the family. Britain’s Air Accidents Investigation Branch (AAIB) then co-ordinated the recovery. The AAIB said that extensive video footage captured of the sunken wreckage is expected to “provide valuable evidence for our safety investigation”.